A common myth is that before the lumberjacks went to work, all of Michigan was covered by a vast pine forest. While this was true of large parts of northern Michigan, the southern half of the lower peninsula was mostly a broad-leaved hardwood forest dominated by oak, hickory, maple, and beech. American Chestnut and American Elm were also a major part of the forest canopy in southeast Michigan before diseases from Asia and Europe hit in the early 1900s. Often called oak-hickory forest, because of their dominance in the canopy, this broad-leaved forest extended from southern Michigan down through the southeastern United States, being the northern fringe of what is called the central hardwoods. Traveling "up-north", you may have noticed conifer trees, evergreen cone-bearing trees with needles, increase across the landscape. By the time you are north of Saginaw Bay, pine and spruce stand out amongst the deciduous trees, flowering broad-leaved trees that drop their leaves in the fall. This is Michigan's northern hardwood forest, also known as the "mixed forest", "Great Lakes - Saint Lawrence forest", or "The North Woods". It stretches from Maine to Minnesota, and south in the Appalachian Mountains. Eastern White Pine blends with Red Maple, Paper Birch, Sugar Maple, American Beech, Yellow Birch, and Eastern Hemlock. Red Pine occupies the drier slopes. Anyone that frequents northern Michigan has seen the extensive row plantations of Red Pine, most of which will be harvested for paper pulp. Jack Pine covers the driest sand plains, well known for periodic fires that open their cones and release their seeds. Balsam Fir grows mostly in the swamps, but extends up into the drier areas. Swamps are full of Northern White-cedar, Black Spruce, and Tamarack or Eastern Larch, the only conifer tree in Michigan that is deciduous, dropping its needles in fall. Ecologists have long studied a "tension zone" or "transition zone" that divides the lower peninsula of Michigan roughly in half, north of which conifer trees are a major part of the forest along with broad-leaved hardwood trees, and south of which conifers are largely absent. The combination of climate and soils north of the transition zone favors northern vegetation, and south favors southern vegetation. The transition zone is a broad band, up to roughly 100 miles wide, running from near Muskegon on Lake Michigan, to the Saginaw Bay and across the northern tip of the Thumb. It is the landscape north of the transition zone that most people associate with being "up-north". For some, a vacation experience is lacking without it. Although there is some disagreement as to the precise location and extent of the transition zone, it is certain that many northern plant species reach their southern range limit there, and conversely, many southern plant species reach their northern limits. Some experts consider the transition zone to extend down through the lower part of the Thumb, but most restrict it to northern Huron County. Regardless, the occurrence of northern forest south of Saginaw Bay is unusual. The prerequisite for northern forest in the Thumb appears to be sandy soil. Sands are more acidic and favor northern vegetation. Sand was deposited in the Thumb on glacial lakeplains where the waters of Lake Huron once covered the land, glacial beaches and outwash plains. Also, the cooler growing season near Lake Huron appears to favor northern vegetation. Other factors may include a high water table, and possibly the former influence of fire. There even appear to be "frost pockets" southwest of Port Huron, in low areas with high groundwater, which remain significantly colder than the surrounding landscape, maintaining nearly boreal plant communities, more typical of regions north of the Great Lakes. Very pronounced northern forest habitat is concentrated in the Port Huron area, west through the Wadhams and Ruby area, and south as far down as the City of Saint Clair. It is easily recognized while driving toward Port Huron on I-94 or I-69 by the sudden appearance of Paper Birch and Eastern White Pine, giving the Blue Water Area its "vacation land" feel. Northern forest extends up through Sanilac and Huron Counties mostly along the Lake Huron shoreline where Northern White-cedar is very prolific. Yellow Birch and Eastern Hemlock become more abundant in ravines and along glacial beach ridges. Driving up M-25 often feels as though it is out of place, like it should be a few hundred miles further north. Northern forest is also scattered across the sandier parts of Tuscola County, where Saginaw Bay once extended inland. 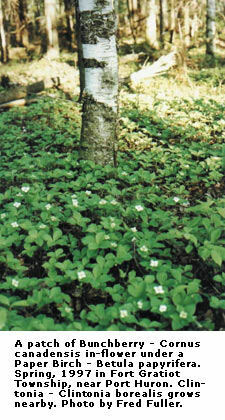 An array of woodland shrubs and herbs are associated with these forests. Most are northern species. A few are more southern, adding to the unique north-meets-south aspect of some of our habitat. Bracken Fern, Wintergreen, Bristly Dewberry, Canada Mayflower, Wild Sarsaparilla, Lycopodium, and Low Sweet Blueberry are almost always present. Nearly as reliable are Serviceberry, Northern Wild-raisin, Speckled Alder, Common Highbush Blueberry, Downy Arrow-wood, Large-leaved Aster, Foamflower, Star-flower, Rose Twisted-stalk, Fringed Polygala, Partridgeberry, Goldthread, Bunchberry, Northern Lady Fern, Cinnamon Fern and Royal Fern. Occasionally Clintonia, Indian Cucumber-root, and Dwarf Ginseng are found. Rarely, you will find Rattlesnake Plantain, Pink Lady-slipper, and even Painted Trillium, a Michigan Endangered wildflower that will be the subject of next month's article.